All great outfits! I have that “My coffee needs coffee” tee shirt and it is one of my favorites! Congrats on house! Love these summaries. Glad to see you wearing shorts often. We are in the south – shorts are a must wear most of the time (of course not for all occasions). Just don’t see how people around here are able to wear pants/slacks/jeans unless they are inside the majority of the day. Yay for pool pics! And the sun streaming through the window behind you in one of the photos! 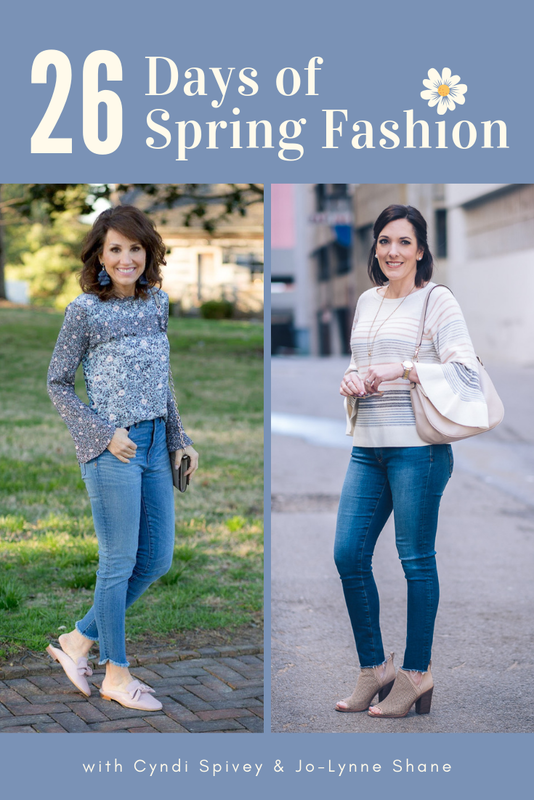 Yep, cute jeans, flattering shirt, and accessories is definitely your go-to outfit-mine too. Easy and so versatile. In Delaware we say ‘the beach’ but when headed to NJ, we say ‘down the shore’ -hubby is a South Philly boy 😉. We go to Margate (family) and Avalon (friends there), which shore is your spot? My husband is from Philly and also says “down the shore.” I am from Baltimore, and we say “down the ocean.” Have a great vacation! Another good round up! Have a wonderful vacation. It’s good you’re still taking it even though you just moved. Safe travels! At your suggestion, I ordered the AG Legging Raw Hem Ankle Skinny Jeans. Have never had a raw hem jean and now question….Do they ravel when washed??? A little but that just adds to the look. 🙂 I do snip them when they get too long. I hope everything about this family beach trip will be perfect! Like a lot of areas across the country, we are having severe thunderstorms today, but tornadoes are not expected, thank goodness. I’m so glad we came home from the NC mountains yesterday. I like seeing what you really wear. I need to learn how to front tuck my coffee ☕️ tee so it looks nice from every angle. It’s great that your new handbag has the protective feet on the bottom! I LOVE the fleece jacket from Nordstrom, and I think our granddaughter will be happy with hers. The sleeves are a tad long, but it is a very nice fit in every other way. Safe travels to the beach 🏖! Have fun at the beach. It’s a well deserved break from all the stress of moving. I hope your back has recovered from your incident and is not an ongoing thing. I had back problems for a few years and had to quit work. By the time I drove home, I couldn’t get out of my car. It improved with the help of a chiropractor and regular back exercises. I never did go back to working though. Lazy me! Anyhow, drive safe. Another fun post! Thanks! I finally decided to order the Uggs loafers from the sale after seeing them in several of your posts. I’ve been looking for some for awhile and these are so cute. I love the red, but know I won’t wear them as much as black, so went with the neutral. Have fun at the beach! You’ll love them! They’re even more comfy now that I’m breaking them in.